“Di… di… where are you Ms. Anika Mukherjee, di…” Ishu happily jumped around while calling her di continuously. “What happened Ishu?” Anika came listening to her sister’s pleasant but not so pleasant voice as she was literally shouting. “I got it… I did it… I love you di” madam, Anika has asked what is the matter and here you are jumping and dancing around her uttering these. “What? What did you do?” she repeated trying to get freed from the hug… but… alas… the hug tightened. “My group got the Udaipur project” Ishana at last left her di from the hug and answered. “What?” shock is not the word to describe the expression. “Yes di… we at last got the project” second hug followed. “Congratulations my girl… that’s such a great news, did you share this with Maa and Baba?” Anika reciprocated more tightly. “Arre… you are the first one to know this and now we will go down and reveal this to them… so come come… let’s go” she dragged Anika and both the sisters went down with the brightest face ever. “Maa… my group got the Udaipur deal” Ishu exclaimed. “Ishu di… congratulations, now give me that robotic car to me… that’s my gift, after all I am lucky and that’s why you got the project… haha… now it’s gift time bub…” BUB? From where did Sahil hear this name? Anika’s eyes widened as the unwanted memories again knocked the door of her brain. “Dekhecho eita hochche amaar meye, she is my girl” Ishana’s father patted her back lovingly and proudly. “Ohhooo… she is my girl as well okay mister? Now listen go to the market soon, today we will have a khidkitod celebration” ahaannn Mrs. mother using new terms. “Maa… what about my robotic car” the poor soul has nothing to do with the celebration or the special good but the robotic car. “Arre done, we two sisters will gift you that” good solution… isn’t it? The family was happily discussing about the celebration when the calling bell interrupted them. ‘Ting ting‘ the calling bell called. “Coming” Anika answered and stepped forward. There stood Prem and his parents with a bright smile over their face with a packet in their hand. “Welcome… welcome…” Mrs. and Mr. Mukherjee folded their hands and welcomed the would be relatives inside. “Hahaha… we are very happy with this alliance… thank you so much Anika beta” Prem’s father very lovingly brushed Anika’s head and smiled. Anika smiled back looking at him. “Beta… this saree and the jewellery is for you” Mrs. Roy, Prem’s mother handed her the packet. “No aunty… this is not needed…” Anika denied but rituals are rituals. “No beta… it’s ritual at our place that the bride should wear the saree given by her in laws in her aashirvad” Mrs. Roy explained. “Please you all sit… today we are already celebrating our younger daughter’s success and now our elder daughter too is getting married to your house… please Prem beta, take care of her… she is a bit moody and rude but from her heart she is a very pure soul” Mr. Mukherjee looked at his both daughter’s lovingly. “You don’t worry dada your daughter would stay at our place as our daughter, she would be my princess” Mr. Roy replied. Prem and his parents settled over the couch. “You know what didi I always wanted a daughter, but then Prem took birth and doctor advised me to not go for next pregnancy, but now I got my daughter… Anika would always be my daughter” Mrs. Roy assured. Her tone and words seemed very trustworthy and being an educated family they will seriously keep their daughter happily and like a queen. “What would you take… tea or coffee or something cold?” Anika’s mother asked. “Ummmm… aunty… I would have coffee” Prem answered hesitating a bit and then his parents answered that they would prefer cold drinks. “Maa… I will have to go to meet Om, will have to share this good news with him as well” Ishu said. “Aaahaannn… someone is desparate to visit someone haan?” How can Anika miss this chance to tease her sister. “Di… don’t tease me” Ishu blushed as she commented. “Haan haan… who am I now to tease you… your Om will only tease you na” second teasing sentence. These sisters had done PhD in teasing. Ishana glared at her sister and Anika put finger on her lips and both them smiled. “Bhaiya” Prinku placed her hand over her brother’s shoulder who is staring at the pool. “Yeah Prinku… why are you here?” Shivay straightened himself and jerked his shoulder a bit. “Why have you distanced yourself from me and Rudra bhaiya?” Prinku asked sitting in front of her brother. “I did a blunder Prinku… I don’t know how to solve this mess… then… then how can I let you two to come close to me and get stuck in this mess as well” Shivay lovingly placed his hand over his sister’s head. “What has happened bhaiya?” Prinku asked taking Shivay’s hand in between her’s. “Let the time come… I will share… now you must go, please leave me alone” he pleaded and she just left from there. She can’t see her brother in that situation. It pained her to see the man who has protected them to get broken down every moment each passing day. He is not allowing anyone to go close to him and whoever is asking him the reason he is just ignoring. What has happened? Why suddenly this? And the moment he has heard the news of Anika and someone named Prem’s marriage he has become more silent than ever. Only thing he is busy doing is his work. Extra deals and extra meeting has become the important part of his routine. What has happened? Same question everytime but the answer known to none. “Shivay… at least share the matter with me” this time Om tried. Yes he knows, but not much… he only knows that something is very wrong and he trust his brother a lot. He know the situation must have been wrong but his brother… his brother can never be wrong. “I will Om, but this is not the correct time” he looked back at the still water. “She is going away from you Shivay” Om tried to hit him emotionally. “She should Om… I don’t deserve her” he left a deep sigh and stood up. I’m held his hand and wrapped his arms around Shivay’s shoulder from back. “Don’t punish yourself Shivay, how can you be wrong?” Om asked placing his head over Shivay’s back. “I am myself not sure Om then how will I bind you all… I am guilty, indeed I am… or else why would…” he stopped remembering that his brother know nothing and he for that moment don’t want to receive the matter. “Say Shivay say” Om forced him again just to notice Shivay’s head falling low from high and a sigh leaving his air passage again. “You go Om” Shivay pushed back Om’s hand and went to his room and locked the door. “Di… you are not happy with this marriage” Ishana locked the door. “I am not Ishu, but for now… all I know is…” Ishana did not let her di complete and interrupted. “All you know is your challenge right?” but little did she know that her di was not even bothered about so called challenge. 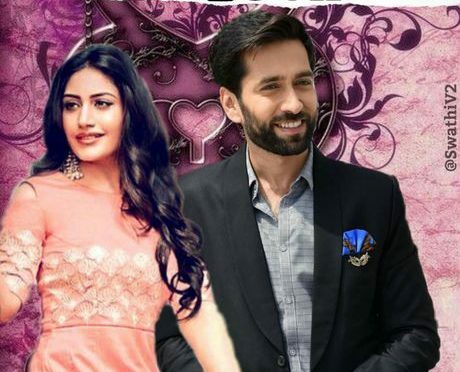 “No Ishu… I am thinking about maa and baba’s reputation, if my marriage breaks at this point of time suddenly then think what would society say and how would our parents get humiliated without any mistake” Anika explained. “Di maa and baba cares about your happiness and only about your happiness, and from when you started to think about this society hun?” she knew that her di don’t give any damn to this society but now… when the matter is about their family the society is getting more priority and not her di’s happiness. “Leave that Ishu… come let’s sleep” she tried to ignore the matter again but Ishu will have to talk to her di, she can’t let her do be all sad and upset. “I will leave the topic but don’t you think that you should go and speak to Mr. Oberoi for once” Ishana tried not to call Shivay as jiju as she knew that her di would be more sad if she does so. “I tried re… I seriously tried but he was adamant not to look at me as well, he ignored me completely and that broke my heart… and that was the soul reason for my anger” so… this was the actual reason that why was she angry. “Ohhh… achcha just for my knowledge, what were the best moment you spent with Mr. Oberoi?” Ishana tried to see the emotion her sister holds for that person inside her heart. “The moment when he hugged me… he was desparate… all he needed was the reciprocation from my side… I… I still remembered how he requested me to reciprocate back and I immediately wrapped him close to my heart… you know… his hot breath… when his hot breath was fanning over my nape, my skin shivered and goosebumps erupted. That was a whole new sensation and feeling for me… in my life I have hugged many other male friends of mine but… but that hug had some different feelings… the special ones you know” Ishana clearly noticed how happy and how glowy her di’s face was when she was explaining about her moments with Shivay, ooopppssyyy… Mr. Oberoi. “Di… please don’t think about this society and stuff, just think about your happiness… will you be happy after marrying that Prem Cheese Ki Dukaan?” she was saying the truth, Prem is a nice guy but a bit cheesy. “I will try to adjust… arranged marriage is all about adjustment Ishu… and… and… my planned wedlock has got ruined so let me get tied to someone in an unplanned way… I would be fine, you just don’t worry” Anika brushed Ishana’s head trying to assure her little sister that she would be all fine and happy. “If I get married to Om… then I will miss you in Oberoi Mansion di… how will I ruke the mansion alone?” Ishana remembered how her di has promised that they both will ruke the Oberoi Mansion after getting married to the heirs of the Oberoi Empire. “You would manage… and if Shivay gets married then the person who he would choose as his life partner would be best… you can trust me over this” again that assuring tone, but that confidence was lacking… no… not at every word but… but at the words where she referred about Shivay’s marriage. “I trust you di… but my di is the best, none can be better as compared to you… you are the best” she side hugged her di as tears went down from both of their eyes. They both lied down to dream about the sudden miracle that would change their life again, that would make their life a fairytale again. Thank God the window was open. He jumped in to see two beauties are sleeping cuddling to each other. Anika faced towards the window as he stepped in, he sat down thinking that she is awake but to his heart’s peace she was asleep trying to dream about her better future. “Sleep D… you dont deserve me yaar… then what should have I done? I can’t ruin your life na… your bub promises you, he won’t marry ever… I promise you D… the way you touched my heart no one would ever do… sleep D…” he whispered silently brushing her hair. So… enjoyed the chappy? Yaar I am myself so unhappy to see them separating, for sure I will reveal everything soon. Thank You so much to everyone who read, liked and commented. Hope you have enjoyed this part as well. If so then please do hit the like button and leave your comment or criticism down. The post Our Unplanned WEDLOCK (WEEKEND STORY)- CHAPTER- 12 appeared first on Telly Updates.